Made in Australia, Oceania, c 1980. This poster has significance as a record of music in youth culture in the 1980s. It helps to illustrate how poster art was used to communicate information to a mass audience about rock music performances in city and suburban venues, and to promote newly released records. The poster is printed in black and red ink. The artist's name is printed in red ink across the top, and it has been autographed by the artist. In the centre of the poster is a black and white photograph of the artist playing an acoustic guitar. 'Australasian Concert Tour' is printed below the photograph, and across the bottom is the date and venue of the performance written in red indelible pen. On back in black ink: '$1.50' crossed out and replaced with '70c'. 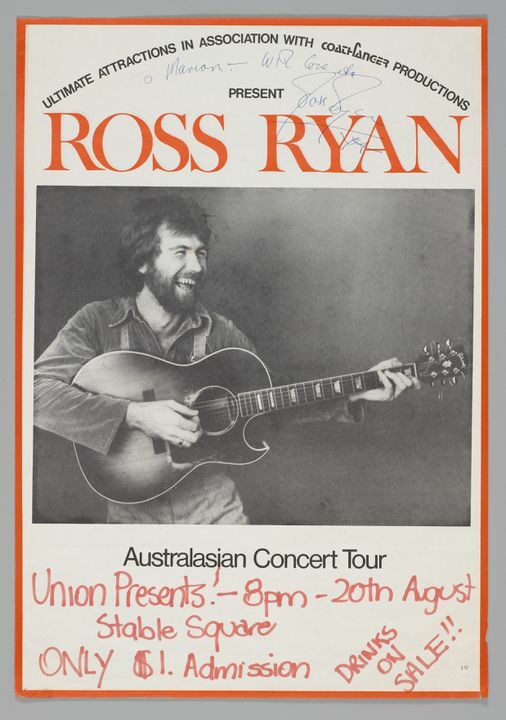 This poster was produced for the Australian music artist Ross Ryan, Sydney, c. 1980. It was produced by Ultimate aAttractions in association with Coathanger Productions. This poster was obtained by Peter Cox in the 1980s as a result of his interest and research in live Australian rock music.